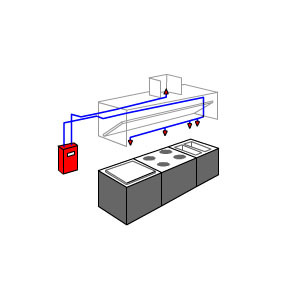 Commercial Kitchens typically have Wet Chemical Fir Suppression Systems, also called Hood Systems. Require semi-annual inspections. Primarily used for kitchens in diners, fast-food chains, and cafeterias. 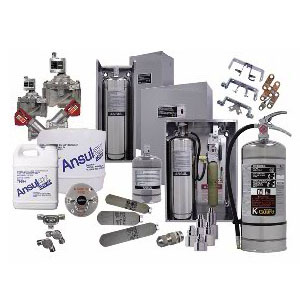 The Ansul R-102 Fire Suppression System is UL300 approved to protect the hood, duct and appliances in restaurant settings. The R-102 Fire Suppression System quickly knocks down flames and cools hot surfaces. It also helps prevent flames from reigniting. Additionally, the liquid chemicals in the R-102 have a nearly neutral pH, making this system ideal for working with cooking equipment. Looking for fire extinguisher services in Dallas, Plano, Frisco, Addison, Richardson, Carrollton, Allen, Murphy, Wylie, Farmers Ranch, or Irving?